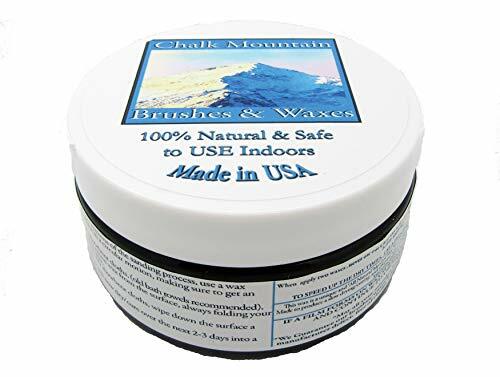 Select from:4oz Natural Clear Wax,4oz Charcoal Black,4oz Dark Antique Wax,4oz Driftwood Grey, 4oz Waterfall Blue,4oz Red,4oz Silver Mountain,4oz Gold Mine, 4oz Antique Bronze,4oz Earth''s Copper & 4oz White (liming) Wax. The dark antiquing wax . . is great for creating an antique look to your painted furniture. The Clear wax to give your painted piece that satin sheen. The Charcoal, Driftwood, White, Red, Blue, Silver & Gold Finishing Wax for accenting or use all by it's self. Now you will want to wax to properly finish your work "NO HEAVY BUFFING REQUIRED". Each 4oz wax is able to cover 1medium dresser and 2-3night stands or similar sized project. developed by us to have Zero VOC, low Odor and Safe to use Indoors. Our waxes are made from the finest waxes and tree-nut oils, to be used on furniture, clothes, cosmetics, metal, wood; with the natural ingredients it can be used on any surface that could use a polishing. ALLERGY WARNING: Wax contains a byproduct of tree nuts.HOW TO USE OUR WAXES After you have finely sanded, removed remains of the sanding process, use a wax brush or soft cloth, to apply the wax to painted surface in a circular motion, making sure to get an even coat into corners&crevices.Let stand for 30-40min using a clean dry absorbent cloth, lightly wipe away excess wax from the surface, folding your cloth using the dry side of the cloth to remove the excess wax. For larger pieces you may need more than one dry cloth to effectively remove excess wax.Now, let stand 12-15hrs. wipe down the surface a second time, to pull off the remaining excess wax. "All Natural" wax will now dry over the next 2-3days into a satiny semi-hard surface. This wax is unique "All Natural' blend of Tree Nut Oil, Brazilian Carnauba, Beeswax & other waxes,made to produce a slow drying/curing, soft paste wax.We Guarantee our waxes & will replace any wax with a Manufacturer defect, free of charge. (photo must be presented for replacement). 100% ALL Natural Chalk Furniture Finishing Wax - 11 colors available to select from. Allergic Warning: Wax made with by-product of tree nuts. We Guarantee our waxes & will replace any wax with a Manufacturer defect, free of charge. (photo must be presented for replacement). If you have any questions about this product by Chalk Mountain Brushes, contact us by completing and submitting the form below. If you are looking for a specif part number, please include it with your message. By SHEFFIELD BRONZE PAINT CORP.